A friend shared with me last Friday some of the tools he used in developing newsletters. One of his latest release featured a bunch of words in different colors, sizes, and orientation. The quote "play on words" never looked so good. He then shared to me that he used Wordle for it. 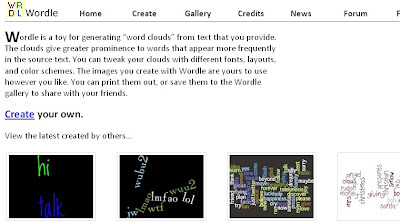 It's a nifty online toy which generates word clouds from text you give the system with. The resulting image is free for you to use how ever you like. Thought I'd compile the things I learn along the way in this blog. That way, I have something to refer on and not forget things. Like when somebody asked me about Web 2.0 and I knew what it was about but acted like I didn't know it and it may well have cost me something more.